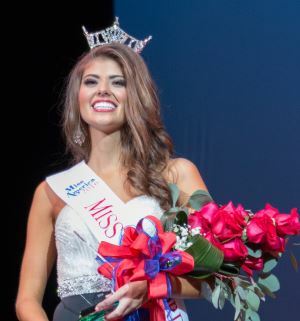 Allyson Nuwayhid, a sophomore education major from Huntsville, Alabama, was crowned Miss Samford University 2016 on Thursday, Oct. 8. Nuwayhid will represent Samford in the Miss Alabama scholarship pageant in June. Her pageant platform is Investing in the Leaders of Tomorrow. She also won the swimsuit competition at the pageant. Her talent presentation was a Bollywood dance, “Dhoom Taana.” She is the daughter of Ramsay and Elizabeth Nuwayhid. Finalists were Riley Ford, a junior communication studies major, first runner-up; and Aly York, a freshman pre-pharmacy major, second runner-up. Karen McCall, a senior nursing major, won the talent award for her dance presentation to “Somebody to Love.” Grace Okoro, a senior psychology major, won the Spirit of Samford award, voted on by contestants and pageant staff.